You are curenlty in Salter Labs Aire Plus® European Compressor 6-2/3" L X 5-2/3" W X 4-2/5" H, Weight: 2/7 Lb, Electrical Requirements: 230v, 50hz, 1.9a, Free Flow 10 Lpm, Liter Flow 6 Lpm made by Salter and asigned to category. The Salter Aire Plus® Is A Durable, Reliable And Easy To Use Compressor. Aerosol Delivery Using The Salter Aire Plus® Compressor Combined With A Salter Nebutech® Hdn® Or Salter 8900 Series Small Volume Jet Nebulizer Provides Quick, Efficient And Convenient Delivery Of Aerosolized Medication, Minimizing Medication Waste And Increasing Patient Compliance. A Lightweight, Portable, Quiet Compressor For Powering Aerosol Generating Medication Nebulizers. It Is Engineered For Long Term Durability And Cost Effectiveness. The Flow Outlet Fitting, Fresh Air Inlet Filter, And Rocker Style On/off Switch Are Recessed To Protect From Accidental Breakage. There Is A Convenient Built In Hand-Grip For Easy Transport. A Unique, Tip Proof Nebulizer Docking Port Is Built Into The Case. 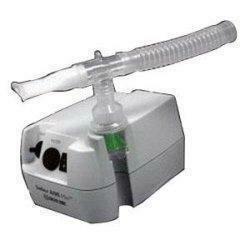 An Optional Handy Travel Bag With Extra Storage For Nebulizer Kits Is Available. Solid State Components, 5 Year Warranty. You have selected Salter Labs Aire Plus® European Compressor 6-2/3" L X 5-2/3" W X 4-2/5" H, Weight: 2/7 Lb, Electrical Requirements: 230v, 50hz, 1.9a, Free Flow 10 Lpm, Liter Flow 6 Lpm from Aerosol Machines. We hope that this Salter Labs Aire Plus® European Compressor 6-2/3" L X 5-2/3" W X 4-2/5" H, Weight: 2/7 Lb, Electrical Requirements: 230v, 50hz, 1.9a, Free Flow 10 Lpm, Liter Flow 6 Lpm made by Salter is what you were looking for. If you have any questions about this particular Salter Labs Aire Plus® European Compressor 6-2/3" L X 5-2/3" W X 4-2/5" H, Weight: 2/7 Lb, Electrical Requirements: 230v, 50hz, 1.9a, Free Flow 10 Lpm, Liter Flow 6 Lpm or any other products from Aerosol Machines, please call us. We have an experienced staff that will gladly help pick out the correct Salter Labs Aire Plus® European Compressor 6-2/3" L X 5-2/3" W X 4-2/5" H, Weight: 2/7 Lb, Electrical Requirements: 230v, 50hz, 1.9a, Free Flow 10 Lpm, Liter Flow 6 Lpm for you, also. If you are looking to make a purchase of Salter Labs Aire Plus® European Compressor 6-2/3" L X 5-2/3" W X 4-2/5" H, Weight: 2/7 Lb, Electrical Requirements: 230v, 50hz, 1.9a, Free Flow 10 Lpm, Liter Flow 6 Lpm in large quantity or you are a Hospital or Medical facility and need help on making a purchase of Salter Labs Aire Plus® European Compressor 6-2/3" L X 5-2/3" W X 4-2/5" H, Weight: 2/7 Lb, Electrical Requirements: 230v, 50hz, 1.9a, Free Flow 10 Lpm, Liter Flow 6 Lpm made by Salter, please contact us.